A clear, low odour, water based, all purpose treatment, to prevent insect attack, re-infestation and protect from fungal decay. Also protects against wet rot, dry rot and woodworm. Coverage rate of 3.5 to 5m2 per litre (typically requires 2-3 uniform coats). 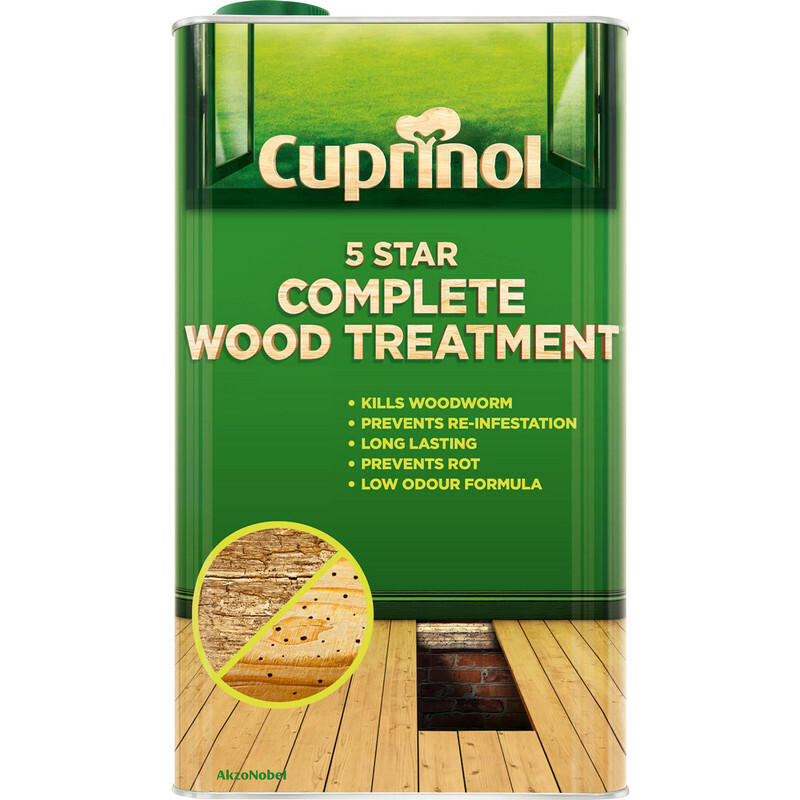 Cuprinol 5 Star Complete Wood Treatment 5L Clear is rated 4.9 out of 5 by 9. Rated 5 out of 5 by SB55 from Hope it does what it says on the can! Hope it does what it says on the can! Only time will tell if it stops all infection. Rated 5 out of 5 by denc from peace of mind Much easier to apply than the old spirit based product. Very little residual odour and no lasting staining as far as I can see. it does appear to soak in well so hopefully will give good protection. Rated 5 out of 5 by DIYMAN01 from Reliable Wood Treatment I have used this product for many years on various items, both inside (e.g. when replacing window frames) and outside (e.g. for plant stakes or for bare patches on fencing as a pre-treatment before painting). It seems to be very good at prolonging the life of wood and preventing fungus attacks etc, as claimed on the description. The product is almost clear and dries without coloration ready for later painting/treatment if required. Rated 5 out of 5 by Landrovernut from Great service Competitive prices, next day delivery and free if you spend over £10 What more do you need? Rated 4 out of 5 by Octavia from How do you know it works Easy to apply and soaks in well but you will only know it works if you did a 5 year test alongside a piece of untreated wood. Respected company so I an happy to believe it does work.